Ultralight airplanes, light sport aircraft and/or microlight airplanes are the answer to the dreams of all aviation and flying enthusiasts who could never afford much more than the occasional flying lesson or joy flight. Today just about anyone who is serious about flying and owning there own airplane and/or aircraft can more easily get airborne thanks to the Ultralight. How many times have you just stopped and wondered what it would be like to just take-off for a while? No I don't just mean to get away from it all - I mean to literally take-off and fly. This wonderful aircraft can be used for many different purposes. People fly them for leisure and business. Whether it be the police or armed services for surveillance or an aircraft charter service as joy flights or as a light cargo aircraft. The ultralight is only limited by ones imagination. Before you go searching for ultralight airplanes for sale check the different types of ultralight aircraft below. Ultralights were created from hang gliders in the late 1970's - early 1980's. After many a time when unfavorable wind direction meant that launching a glider off a cliff was impossible the need for assistance was realized. That assistance came in the form of a small engine attached to the glider itself. This small engine not only meant powered take-offs but also faster climbing ability and of course longer flying times. Take this powered glider one step further by adding landing gear and there you have the flying Ultralight (sometimes called the Microlight) airplane. Naturally since that time there has been many advancements from a motorized hang glider to the Ultralight as we now know it. This advancement includes the involvement of helicopters. Today it is believed that in most affluent countries Ultralight aircraft account for approximately 20% of all civil aircraft. Naturally, pilots flying large commercial aircraft such as a Boeing 737s or 747s like those owned by United Airlines, Southwest Airlines, Continental Airlines and other major airline companies also fly these ultralights for fun. 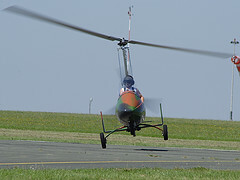 The Gyrocopter is the first of the ultralights that we look at. This is a single or dual seater with the engine mounted on the cart. It operates making use of a rotary wing and a propeller situated behind the engine. The rotary wing is NOT powered by the engine. Therefore rotation is due to wind passing through it. The next variation of a flying Ultralight is the powered parachute and powered paragliding. As the name suggests this is a parachute with an engine and a trike/cart. Flight levels are generally between 5 - 1500 feet and operate at a speed of 40 - 60km/h. The world record for height reached in a powered parachute is more than 18000' (or 5.5km). 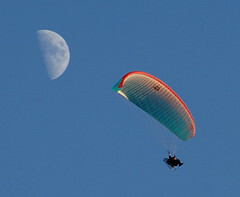 Take a look at this amazing site for more paragliding info. The next of the ultralight airplanes is the Weight Shift Ultralight aircraft. This is basically a well advanced powered hang glider. It includes a cart or trike on which to sit and steer your aircraft. Also the engine is mounted on the trike. 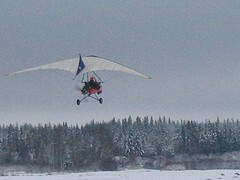 Weight shift ultralight aircraft are excellent climbers and are perfect for rough field take-offs and landings as seen in this photo. Most of the early ultralights built were 2 axis fixed wing airplanes. All that means is that each airplane was fitted without ailerons (the smaller flaps located toward the wing tips). Therefore by means of a yoke one could change the elevators (pitch - altering the level of flight) and the rudder (yaw - altering the direction of flight). Finally the last of the ultralights is the 3 Axis Fixed Wing airplane. This ultralight is more like the traditional airplane that we all know. The 3rd axis is naturally the inclusion of ailerons which cause the plane to roll in and out of a turn. Would you like to see more of the ultralight airplane? Of course you would. The Lazair ultralight airplane is an aircraft that was created by a young man who was learning to become an engineer. Take a look at this amazing ultralight he created, manufactured and sold right here. Another jaw-dropping ultralight is manufactured by Quicksilver Ultralights. Quicksilver have a range of ultralight aircraft they have manufactured over time and can be viewed and purchased here. I know, I know. If you are anything like me your passion for aircraft is not easily met. You just have to have more and more. Good, cause there are more ultralight airplanes for you right here.